ISU students outside of Hovey Hall during Monday protest to convince administrators to declare ISU a "sanctuary campus." Chris Homan, left, of ISU maintenance department, debates with a student during Monday's protest to show support for immigrant students. Homan argues illegal immigration leads to "chaos." Shouting "Whose campus? Our campus!" the protesters said they were also targeting Bloomington City Council member Mboka Mwilambwe, who works in ISU's Office of Equal Opportunity and Access. 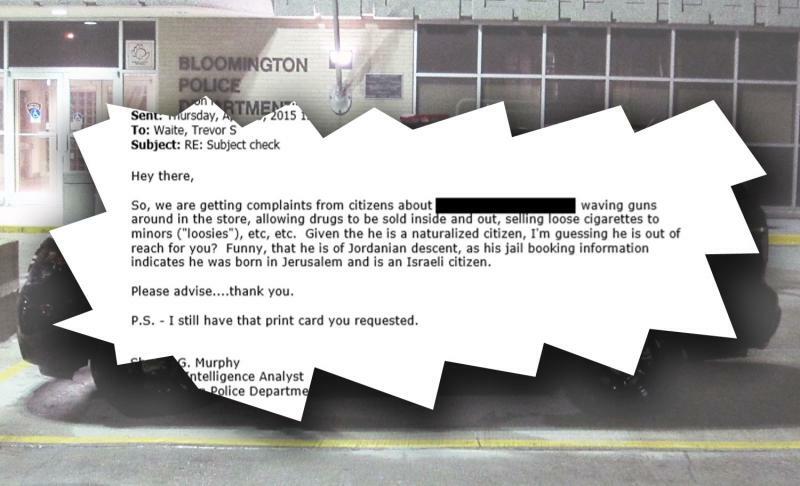 The students complained Mwilambwe, himself an immigrant, was one of the aldermen who has tried to table a vote on a proposed Welcoming City ordinance for Bloomington. Mwilambwe was not immediately available for comment. "If you are going to work at the university, care about your students, all of them. 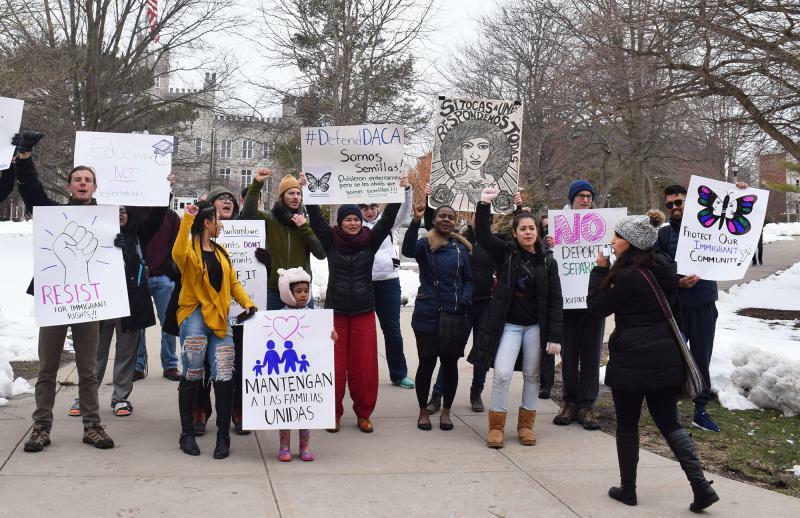 That is one of the reasons we are here, we want to protect immigrants, everyone in the university community," said Michelle Hunt, a senior physics major. "And it is important that students are aware that we have employees who should be very close to this stuff and should recognize that (enforcement actions against illegal immigrants) is going on in the community," she added. Hunt said undocumented students fear being arrested and sent to detention centers now that the Trump administration has stepped up immigration enforcement. 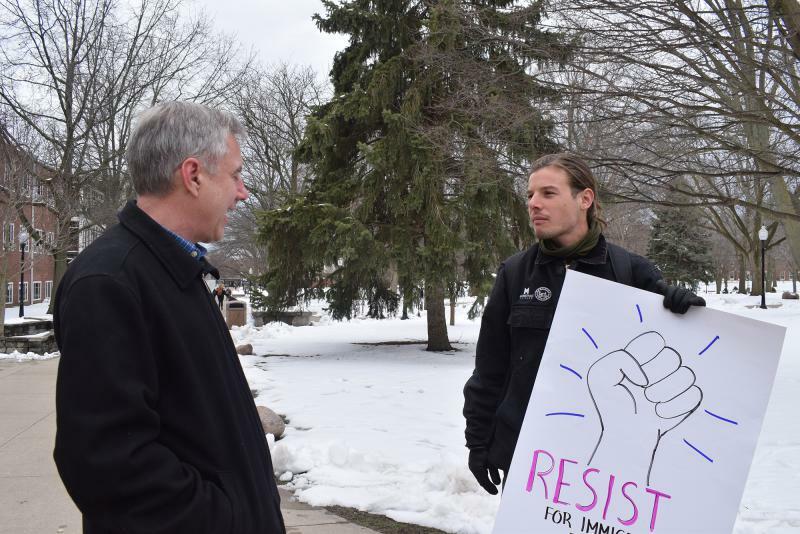 The protesters said they were disappointed that no one from the administration ventured out of Hovey Hall to engage with them. ISU administrators have acknowledged there are undocumented immigrants enrolled at the university. They have said they want to protect these students, but have so far declined to declare ISU an official sanctuary campus. One ISU employee passing by the protest, Chris Homan of the Facilities department, stopped to debate briefly with the student demonstrators. Homan said his daughter is an immigrant who came to the country legally. He said if illegal immigration continues unchecked, it will result in "chaos." "Do you think we should just let anyone come who wants to?" Homan asked the students. "Our system and our structures are meant to cater to people with privilege," one of the protesters shot back. The demonstration was timed to coincide with the fast many community activists began on Sunday to show solidarity with immigrants as part of a Keep Families Together protest.